You are here: Home » Two down…many more to go. Two down…many more to go. As I meandered the aisles of the local drugstore, I realized that the holidays were just around the corner. Well, less ‘realized’ and more ‘hit-in-the-face’ with all the seasonal chocolate already on display. Out with Halloween, in with Christmas! I admit, I do enjoy holiday chocolate – especially the novelty box sets. I am looking forward to the Loacker Advent calendar! Maybe I’ll buy one for work and one for home. Hee hee…. 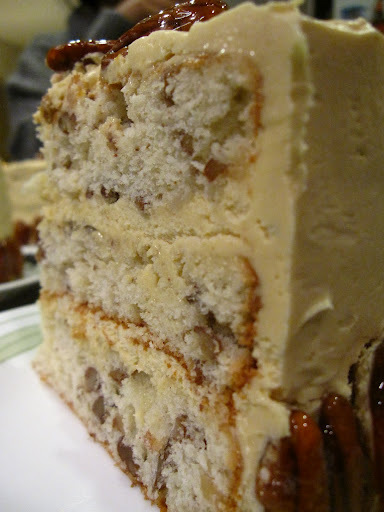 Anyway – this past week I made two cakes, a Boston Cream and a Maple Pecan. The Boston Cream was for a coworker and I forgot to take photos – but another colleague did, so I’ll have to remind myself to ask for the pics. 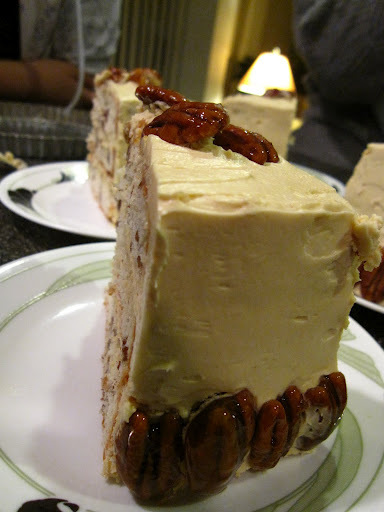 The cake itself was flavoured with maple with a very generous helping of chopped pecans. It was frosted with a maple buttercream (it worked this time!). I used a different recipe for , provided by the lovely Martha Stewart. It was a lot easier than the Joy of Cooking version, although it did get a little soupy. A quick 15 min in the freezer solved that and it fluffed up nicely after that (also with the help of about 1/2 cup of icing sugar as well as a stabilizer). I couldn’t get a good pic of the finished and decorated cake, I hadn’t really thought of a good concept on how to frame the shot, so here are a few of cake slices. Cake decorating is difficult, yo! 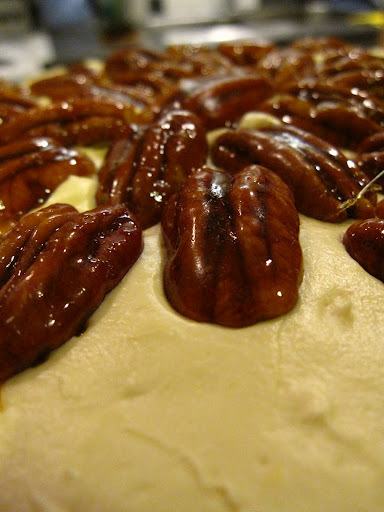 Almost forgot – the cake was decorated with candied pecans. Very easy to do – caramelize 1 cup of sugar over medium high heat until medium-amber in colour. Gently stir in 1 cup of pecans and make sure each nut is coated. Take off the heat (if you haven’t already) and CAREFULLY remove each pecan onto a parchment-lined cookie sheet. They recommended two forks. I recommend a long skewer. It’s less messy if you work quickly and doesn’t collect as much caramel build-up. Let cool 5 min and then decorate (or eat)! ← Comin’ back with a vengeance!